How do you feel after you have watched 200+ pictures of Steve Winter and heard the stories behind them? Well you end up hating every picture you ever took and you want to smash your camera. Till you write this to Steve himself and actually get a reply from him saying, “All our photos hold emotion for ourselves and others.” After reading that, I decided I am not going to break the camera after all. If you visit his website you will see most of the pictures that we saw plus we got to see some more. But It was the stories behind the pictures that made the workshop most compelling. Two things from the workshop are going to remain with me forever. He told us that these days the definition of a good picture is to zoom into an animal or bird and get a sharp picture but he does not like that. He prefers shooting at F11 to F22 as it gives a chance to show the animal in its habitat. The second is that each of those pictures required a lot of planning and hard work, they did not happen by chance. For example this Flamingo picture, he was telling involved travelling in bullock carts, the place was full of mosquitoes and as soon as he moved a step there were three to four thousand Flamingos who would move a step back as well! Every picture had a story like that behind it that was told with passion. And he highlighted that these pictures involved working in close cooperation with the locals. And then there are his Snow Leopard pictures! He was telling they landed up in Delhi with 33 piece of baggage that was full of equipment! All of that was transferred to Leh and then to the actual site where they pitched camps. I always thought that the pictures came from actual sightings. But Steve was telling that they set trap cameras which will capture a picture through its sensors every time an animal crossed it! He said it took 6 hours of walking to check out if everything was working with his 24 or so trap cameras. And it took months and months to get those pictures. No wonder he got the BBC Wildlife Photographer of the Year Award in 2008 for his Snow Leopard picture. 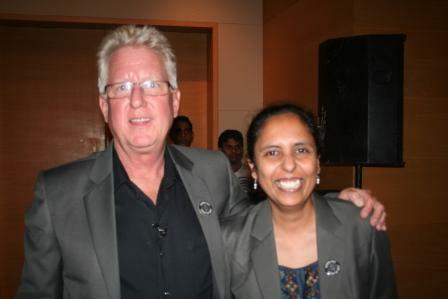 You can see from my ear to ear grin how much I enjoyed the workshop organized by the Skoda Yeti ROWE team. Will be at Mumbai today for the launch of Skoda Yeto ROWE calender. Flying in the morning and flying out at night. Chhavi these days asks me, “Aap Bombo jaate ho?” (You go to Bombo?) Bombo is her way of saying Bombay, which she hears from us being mentioned because of my recent two trips in two weeks! 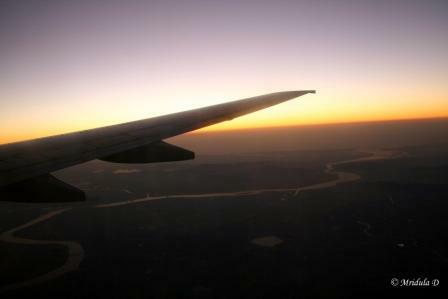 Clicked this picture last week but then it was an evening flight and I was looking forward to the sunset. No sunrise or sunset in this flight! Still I have done a web check-in to get my window seats. We also get to hear Steve Winter of Nat Geo. Just check out his snow leopard section! Well, never thought I would appear in a video that would have Skoda and National Geographic along with it! Gir was a fun trip for sure. Well, watch the video and enjoy.